Storytelling in the video game medium can be challenging, but it comes with some unique benefits. You, the player, will typically empathize with the playable character since we see the world from their perspective. Because of this, you will often see video game stories feature plot-twists involving the identity, mental state or even physiology of our playable character. Final Fantasy X used Tidus’ naive perspective to shock us with a revelation that every other character already knew about. In Final Fantasy VII we got a gameplay sequence told by an unreliable narrator. This type of plot-twist is also fairly common in Western RPGs, such as Knights of the Old Republic or Bioshock. However, I would argue that Final Fantasy IX makes the best use of this effect. Whilst it may not be my absolute favorite (that would be FFVI), there is no doubt that it wins the award for “most underrated Final Fantasy”; it’s critically acclaimed yet its fanbase is comparatively small. 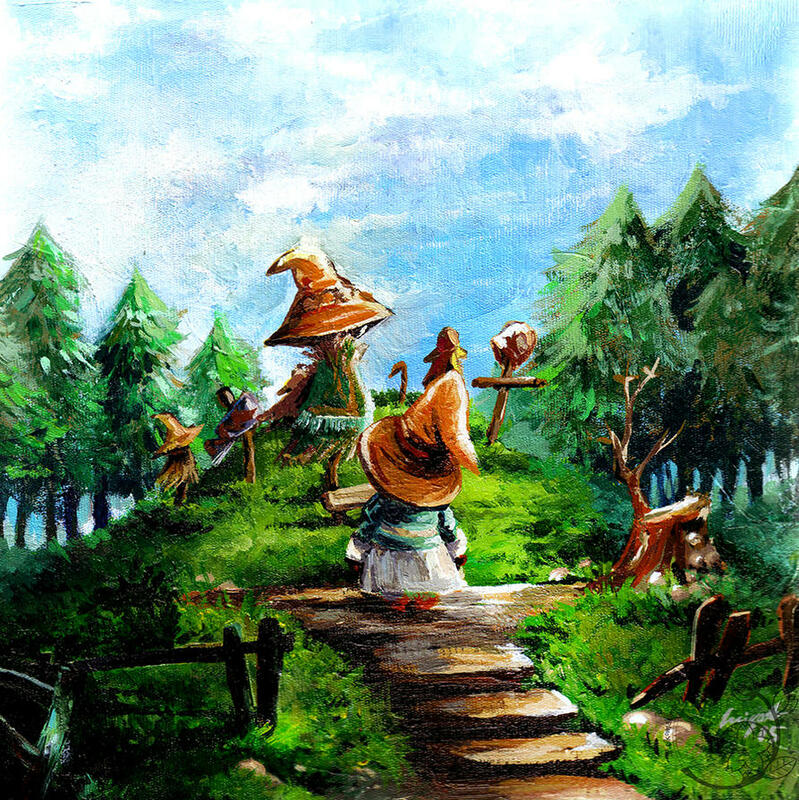 As many of you may know, Final Fantasy IX alludes to every single Final Fantasy game ever. Not only that, but Hironobu Sakaguchi himself considers Final Fantasy IX to be the “closest to my ideal view of what Final Fantasy should be.” After having finally played it in 2015, I can definitely see why. Since Final Fantasy IX is a reflection of the series as a whole, the characters are each deconstructions or subversions of the common Final Fantasy archetypes1. For example, Yuffie, Selphie, Vanille, Rikku and XV’s Prompto (and Iris) all come from the same mold: A foreign, typically younger character who’s cheerful attitude contrasts with the oppression and/or genocide of his/her people. For Final Fantasy IX this character is Eiko: she comes from Madain Sari, she’s the last of her kind (until we discover Garnet’s true identity) but compared to someone like Rikku she exhibits a much wider range of emotions such as loneliness, love and jealousy. Steiner is probably the most interesting example; his character is almost a satire of ‘generic goody-two-shoes’ Final Fantasy protagonist. He tries to do what he thinks is ‘right’ (i.e. rescue princess from thief who kidnapped her) but he’s such a stubborn stick-in-the-mud that he refuses to listen even when Garnet is trying to tell him not to ‘rescue’ her! Naturally, over the course of the game, he would become more open-minded and willing to think for himself and forge his own path rather than just do what he’s told. While the cast of FFIX don’t actually have a lot in common, they do share a common trait: Each of them experiences a loss (or change) of identity. Freya travels the world seeking her lost love only to discover that he doesn’t remember her. Garnet escapes her life as a princess and even changes her name to Dagger in order to create her own identity. Amarant is a loner who becomes perplexed by Zidane’s desire to help people regardless of circumstances. Vivi is an obvious call back to the original ‘black mage’ of Final Fantasy, but his personality and demeanor is akin to the ‘child’ character (see also: Hope, Red XIII and Gau). Vivi came aboard the airship accidentally, and spends the first few hours of the game tripping over himself and hanging out with Steiner who respects him as a powerful Black Mage. Then, we arrive at the village of Dali and this is where Final Fantasy IX becomes the game that deserves its acclaim. This scene in question is a phenomenal example of “show, not tell” in a video game. All we see is an assembly line of black mages, an unnerving melody and Vivi who’s just standing there shaking, unable to process the discovery that he is an artificial being. From here, things only get more difficult for Vivi. He tries to communicate with the other black mages to find out more about himself, but instead just ends up watching in horror as the Black Waltz III’s Thundara causes all of the black mages to fall off the airship in one of the game’s most beautiful scenes. Later, on a faraway continent, Vivi discovers a village of Black mages who, like him, have become self-aware and have created a community. Here, Vivi learns yet another horrible truth: He doesn’t have much longer to live. After about a year or two, Black Mages just ‘fall down’ and are buried underground in a cemetery. Vivi, who’s finally discovered his identity, is now forced to accept that in the near future, without any warning, he will die.. Despite his melancholic story, Vivi is able to remain positive with the help of his friends who stay by his side and comfort him during these harsh events, and inspire him to live the remaining few months of his life to the fullest. Zidane, especially, serves as a role model and it’s very fitting that he does. As far as main characters go, Zidane is drastically different from the more aloof Cloud or Squall. He doesn’t keep to himself and instead just acts according to how he feels. Overall, he feels most similar to Locke, although he doesn’t try to pretend he’s not a thief! His entire personality is best defined by his most famous quote “You don’t need a reason to help people” and his constant hitting on Garnet. But ultimately, there is a reason he focuses so much on others: He knows nothing about himself. The only clue to his origin is a flash of blue light. He’s so quick to accept other people regardless of who they are or where they come from because he has no idea who he is or where he comes from. And then, as our party makes our way to Terra, a planet that exists inside of Gaia, we are greeted with a flash of blue light and a bunch of humanoid creatures that all have tails like Zidane. This is the climax of the story and by far the most shocking revelation: Zidane is a genome. We’ve been playing as an artificial being this whole time. For the first time in his life, Zidane doesn’t know who he is anymore. Not only is he an artificial being, he was designed with a specific purpose: To spread the seeds of death and destruction on Gaia. This goes completely against who Zidane considers himself to be and after getting brainwashed by Garland, he has his own identity crisis. It’s a brilliant twist. We’ve been watching Vivi discover and come to terms with his artificial existence. Now, suddenly, the character we’ve been controlling this whole time is revealed to be just the same. Fortunately all his friends, and particularly Garnet, remind him that as much as he tries to be an independent free spirit, he depends on his friends just as much as they depend on him. Realizing this, Zidane is able to come to terms with his own artificiality and now stands against his own creator. But Zidane has a foil. In a brilliant reference to Final Fantasy IV, Kuja is also revealed to be a genome much like Zidane. Suddenly, Kuja’s atrocities (a hearty mix of Kefka and Sephiroth) makes a lot more sense, he was literally created to eradicate life on Gaia. Even his extreme cruelty towards Vivi and the black mages make sense. He despises them, and considers them nothing but tools because that’s all he is to Garland. Here, Kuja experiences the same thing that Vivi experienced back in Black Mage village. Unfortunately, while Vivi had friends to help him accept his impending death, Kuja has and thus he simply cannot accept his own mortality. Instead, he lashes out violently destroying all of Terra out of jealousy. And yet after his final defeat, in spite of all the suffering Kuja brought onto both words, Zidane extends a hand of friendship. Zidane was also designed as an angel of destruction but, as a result of Kuja banishing him to Gaia, he made friends and discovered a new identity for himself. After his journey, Zidane understands that all Kuja really needed was a friend. 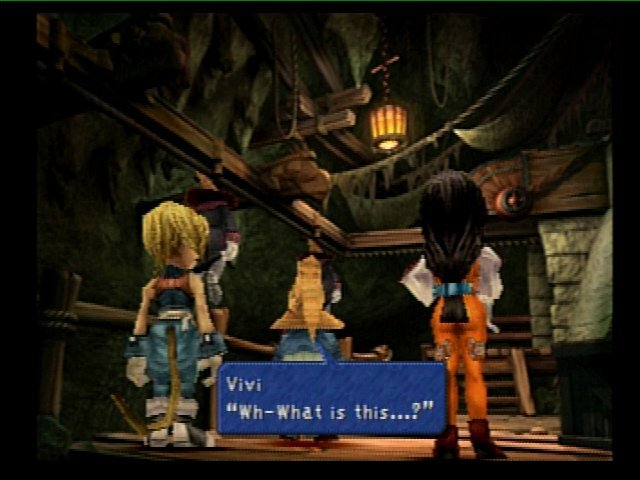 Final Fantasy IX is far more than just a bunch of nostalgic references; it’s a story about finding one’s identity even if that means going against your prescribed societal ‘role’. It’s a story standing resolute, even when your kingdom falls right before your very eyes. But most of all, it’s the story about what it means to be alive. 1 This analysis of FF archetypes is heavily borrowed from Oracle Turret’s blog. In the interest of being upfront about my biases, let me make it clear that Final Fantasy VI is probably my second favorite video game of all time right behind Phoenix Wright: Ace Attorney – Trials & Tribulations1. I adore this video game, I love its characters and I dream of making musical renditions of key FFVI scenes as a proof of concept for video game musical adaptations. Now, this infatuation isn’t terribly shocking because FFVI routinely shows up on almost every “top 10 RPGs of all times” lists, but it does beg the question: Why does it have such universal acclaim? (outside of Japan, at least). I ask this question because if you look specifically at the gameplay of FFVI, it’s good… but not spectacular. While you get a ton of options, most of the combat is just “spam [insert character’s best move] until everything dies”. If you’re familiar with the game, you can probably see where I’m going with this: FFVI is a video game that is renowned specifically for its storyline. Gameplay is important, but Final Fantasy VI shows why one should never underestimate the ability for video games to tell compelling tales. While “Let’s make our story have a protagonist the audience follows” seems like common sense in most storytelling mediums, in video games this is a trap; it’s hard to create a well developed playable character without taking away from the player’s agency. It’s no coincidence that the story-heavy JRPG genre usually2 features a party of characters. Often the best solution to this problem is to cast the playable character and the protagonist as different characters (i.e. Tidus is our playable character but Yuna is the one driving the plot forward) or have the protagonist become temporarily unplayable so their character can be developed (i.e. You control Tifa so that Cloud’s character can develop). But FFVI did something even more unique and more video games need to try this: Having no protagonist at all. Even if we try to sort by “most important” or “who you start the game off as” then the answer is “Terra and Celes”. Final Fantasy VI stands out already by having an extremely large cast, and it works specifically because FFVI is not the story of any single character. The implications are huge. First, it means that FFVI can develop any character without risking taking too much control away from the player; any character can leave the party and the story can carry on unaffected (Terra discovers her esper side and flies off. Then, before we get Terra back in the party, Celes has teleported away!). The only other game that I can think of that takes this ‘no protagonist’ approach to heart is Undertale and, what a surprise, Undertale parodies Aria De Mezzo Carattere, right down to the white dress with blue ribbons. Second, it allows every character to have their fair share of memorable moments. 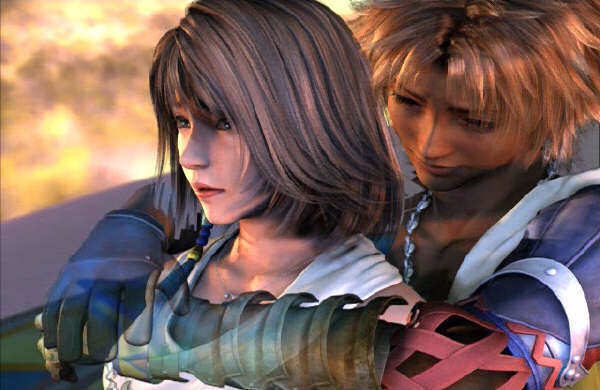 When I think of Terra, I think of how overwhelmed she must have felt during the first part of the game, trying to discover who she is while the empire is searching far and wide for her. When I think of Setzer, I immediately imagine walking down those stairs and seeing memories of Daryl. When I think of Relm, I wonder what Shadow was feeling every time he saw her. When I think of Edgar, I think of the tremendous sacrifice he made for his brother. When I think of Sabin… ok obviously I think of this. Mandatory jokes aside, I think of when he yelled “That’s inhuman!”, blew his cover and bum rushed Kefka at the imperial camp. Even Gau, a character who’s only tangential to the main plot, makes me tear up when I merely think of him saying “f-f-f-father alive. Gau happy”. And of course, when I think of Celes, I think of her darkest hour, and how despite everything that she had been through, she found hope long after many heroes would have given up and uses that hope to inspire her friends and save the world. And if that wasn’t good enough, there is a specific reason why Final Fantasy VI has no singular protagonist. It’s also the same reason why Final Fantasy VI has such a large cast of characters from all four corners of the world. One of my biggest regrets in my gaming life is that I never played FFVI when it first came out and as a result I was well aware of the epic twist before I even started the game. I wish I could know just how it feels to have the rug so thoroughly pulled out from under me. So after many adventures, the empire has ordered a “truce” and declared the war to be over. It’s an obvious ruse and not intended to be surprising. After Kefka absorbs all the espers, Leo has decided he’s had enough. From the get-go, Leo has been portrayed as an opponent but not as a bad person; a foil to Kefka. Once you get a chance to play as him, it seems almost guaranteed that he will join the party! And then he dies. What? That wasn’t supposed to happen! Leo dying is presented as “the shocking twist” but actually serves as a distraction from the real twist of the game. With Leo down and Celes in our party, Kefka and Emporer Geshtal are the only imperials left and now it’s time to assault the floating continent. That setting is no coincidence. “Floating Continent” is not just an exotic location; it’s a common gaming trope usually reserved for “The Final level”. Even Uematsu’s music track for the Floating Continent just screams “final level”. All of this is designed with a specific purpose: To fool the player into thinking this is the end of the game. Now that the trap is in place, our party arrives at the Statues of the Gods. Here, you’d expect to fight Emporer Geshtal but instead you get to experience one of the greatest twists in video game history: Kefka, enraged after getting stabbed by Celes, kills Geshtal and destroys the world. The bad guy wins, and the world will never be the same. Even nowadays, this is an incredibly audacious twist. JRPGs might have the villain inflict easily fixable damage towards the end of the game. But this time, there is no fixing. There’s no going back. The World of Balance is gone. Forever. Just as Sabin and Edgar had to accept the death of their father, just as Cyan had to accept the death of his wife and child, now you must now accept the death of the entire world. I hope that someday Final Fantasy VI gets remade as an open world video game for this exact reason: Can you imagine getting familiar with a virtual world and have it get destroyed!? Imagine doing quests, helping people, traveling around, then suddenly seeing that world and all it’s people get destroyed before your very eyes! Creating such an experience would be a huge risk, but I think the resulting storyline would be incredibly worthwhile. At a time when most video games were still considered “toys” for children; Here’s a game about war, mass-murder, genocide, teenage pregnancy, survivor’s guilt, suicide, sacrifice, depression, accepting the death of a loved one, the apocalypse, how power (magic) corrupts, inter-species relationships, nihilism, and most importantly: The meaning of life. Final Fantasy VI is full of tragedy, sadness, and loss, but what makes that so impactful is that the ultimate morale is one of hope. Kefka becomes nihilistic as the game goes forward. He’s the most powerful being on the planet, is worshiped as a deity, and yet he’s empty inside. Raining light of judgement down on people must have lost its luster a while back, and eventually Kefka doesn’t see the point in anything. Despite being a god, he lets our heroes make it all the way to his chamber3 and greets them like old friends. Here, he challenges our heroes about the purpose and meaning of life because his mind is incapable of love and empathy4. What’s the point? We’re all going to die anyways, why even bother? Why create anything, knowing it will eventually just be destroyed? But our heroes know better because they’ve each found that, even in a decrepit and devastated world, even if your BBF/lover has died, even if your own father has rejected you, life is still worth living because it’s the day-to-day experiences and the times we spend with friends and family that really matter. That’s… incredibly inspiring. At a time when video games were looked down upon as ‘wastes of time’, here’s a game that teaches the player the value of life. Of course, this answer makes even less sense to Kefka, and he vows to destroy life itself, thus initiating one of the greatest boss fights ever conceived. So in the end, if you’ve ever wondered why Final Fantasy VI is so critically acclaimed, here are three ‘overall’ reasons why. Of course, these are far from the only reasons, so you can expect more posts on the topic (and a VG Story Review) at a later time. 1: Notable example of a game where the playable character is separate from the protagonist of the story. See my VG Story Review of Trials and Tribulations here. 2: Notable exception is the Pokemon series, which simplified the story and sacrificed a party of characters for the ability to turn random encounters into characters with a near infinite possible combinations. See my VG Story Review of the first Pokemon game here. 3: During world of Ruin we never see Kefka until the end of the game. I like to imagine that he had the opportunity to finish off our heroes but chose not to because, in his twisted minds, he considers them ‘friends’ and knowing they’ll come to challenge him gives him something to look forward to in his boring divine life. Undertale’s genocide path is one of the most unique experience in video games that works specifically because of it’s narrative. It’s boring, it’s lonely, it’s depressing and it’s extremely frustrating – It’s trying its damn hardest to get you, the player, to quit because you are a heartless serial killer. And if you succeed in your quest, be prepared to have the game permanently altered. Undertale is such an incredible video game story that I had to make this a two-part review. The premise is simple: every monster you encounter in the game can be killed or spared. Should you choose to be a heartless murderer, the game will treat use as such. Conversely, should you choose to extend the hand of friendship to each monster you meet, you may find a way to save them all.